Hi, Villakuyaya fans and friends. I haven’t written an official blog post since 2016, and since then across many chocolate shows around the world, many new friendships, new chocolatier’s, new customers and people who have tried my chocolate whether they loved it or not, so much has changed in my life along this path, that I wanted to share and update my followers. Personally, just a few months back I married my husband in a ceremony in upstate New York near Woodbury Commons. At 42 I am now a wife for the first time and am very happy. In addition, a little before I turn 43 I should be giving birth to my first child, a son. Something I have dreamed of my whole life and is so close to becoming a reality lord willing. In terms of chocolate, we are still a young, growing small business, fighting to compete in a tough, competitive field with edgy new companies, and amazing chocolate popping up almost every week. There are so many amazing new products, new chocolatiers, new bars and great chocolate in the industry at this time, it is hard to obtain and hold your customer's attention and loyalty, as at any time they might taste the new next greatest bar, inclusion or idea. With that being said, I appreciate all of my loyal customers, friends and Villakuyaya Organic Dark Chocolate lovers. It’s a passion project for me to produce these bars in Ecuador and bring my bars to you around the world. From selecting the finest Arriba Nacional cocoa beans, through the various steps of production, across the packaging, logistics and finding a way to interact with customer’s on different levels, it is an honor to try to bring my bars to your coffee tables, or maybe on your couch binge-watching your favorite TV shows, or paired with a glass of wine to make the evening restful and relaxing, or in whatever way you get to enjoy my chocolate. I’ll have some more posts coming soon, as I rededicate myself to digital interactions with loyal friends and customers, but also hopefully some new people who have grown to love or try my chocolate, and want to know what is going on in the chocolate world, or my little part of it. Thanks for reading, and hope everyone is well and enjoying some chocolate. 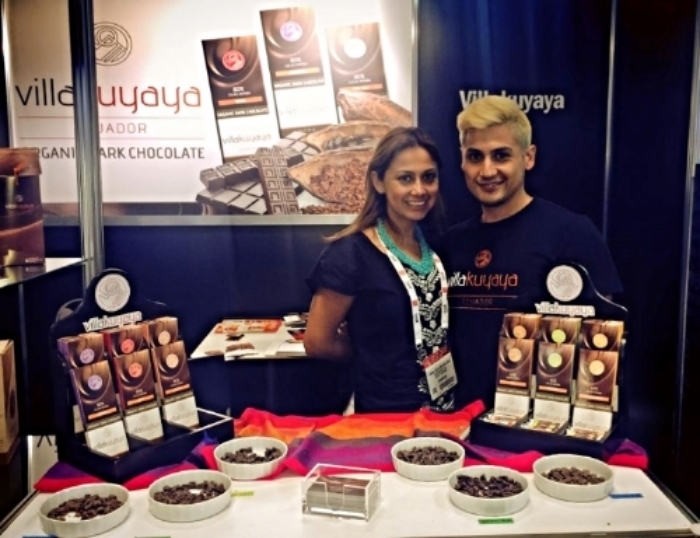 Villakuyaya used the trading platform of the Summer Fancy Food Show to transport visitors to cocoa farms in Esmeraldas - Ecuador, where fine aroma cocoa is harvested. The virtual experience led that visitors discover the fantastic ecosystem that Ecuador has and enhance the daily work of cocoa farmers from harvesting to the final production of chocolate bars. Xavier Pellicer is Catalan Chef with two Michelin stars, his philosophy about cooking is a modus vivendi of his Ayurveda diet. In spite of being the creative artist, delivers all the attention to seasonal vegetables seducing the palates of all the guests. He is passionate about experiencing each of their dishes through the sensations that transmits your heart. The idea of its creators is to devise a supermarket which offers Eco friendly 100% organic crops and other products cosmetics, dietetics and yoga products, reaching a wide variety as nutritious. Also in the latest additions Woki Family Tribe, added the proposal of gastronomy of the Chef Xavier Pellicer reflected in the merger of two spaces that transmit healthy and natural life with organic food. Inside the restaurant is 100% ecological market highlighting the best seasonal products, thus creating an ideal place for lovers of natural food, the taste and simplicity of its dishes instead. Villakuyaya in the Organic Market ? Villakuyaya has been considered as a possible candidate of organic selection to display your most demanding palates, with the approval of the Chef Xavier Pellicer is sure to join the Organic Market. Event marketing of coffee, cocoa and chocolate, Villakuyaya participating as an innovative brand. The " pepa de oro" represented in several brands of dark chocolate promoting the quality of Ecuadorian cocoa bean. Villakuyaya creating high expectations with their participation. Stockholm held the promotional show, in which Villakuyaya Organic Dark Chocolatestarts its appearance in the Nordic countries, with its excellent aroma and flavor of Esmeraldas cocoa belonging to the Pacific coast of Ecuador. On February 8th, the second Congress of Continental Patrimony was held at the Bicentennial Center in Quito Ecuador. The talk "Cocoa and Chocolate Andino " was dictated by Idaly Farfán , chef and technical advisor on chocolate and cocoa for VillaKuyaya LLC. Farfán conducted a dynamic talk in which she explained the process by which the product passes starting from harvest to become artisanal chocolate. "Fine" or "flavour" beans, the top-quality varieties used in gourmet products because of their superior taste, account for only 5% of the world's cocoa production, but demand is increasing. Much like wine, chocolate reflects the flavours of the region where cocoa beans are grown, and how they are dried and fermented. Over the last decade, as the demand for more flavourful cocoa has risen, Ecuador has emerged as the pre-eminent exporter of fine beans. It is a favourite destination for globetrotting chocolatiers in search of the best, and cocoa production has also become a sustainable source of income for Ecuador's farmers. "Farmers didn't use to pay much attention to cocoa," says Ignacio Estupinan, a 66-year-old farmer who is known in the area as Don Nacho. "Now everybody knows how valuable cocoa is. It's the best business we have," he adds. Scholars believe cocoa plants first grew in the Amazon basin, possibly in the area that now corresponds to Venezuela, another large cocoa exporter. Ecuador's native cocoa beans are known as "Nacional" or "Arriba", a name believed to derive from the location of its discovery. Arriba means "up river" and many cocoa plantations were located along the Guayas river, which flows towards the port of Guayaquil, Ecuador's largest city.